With the move away from physical music and towards ultra-consumption via streaming, the importance of song credits is being eroded at the fastest rate in history. They still exist, notably on Tidal, as well as places like Genius and Wikipedia, but the nature of how we listen to music, via playlists and an infinite loop of content, means behind the scenes superstars are being overlooked. 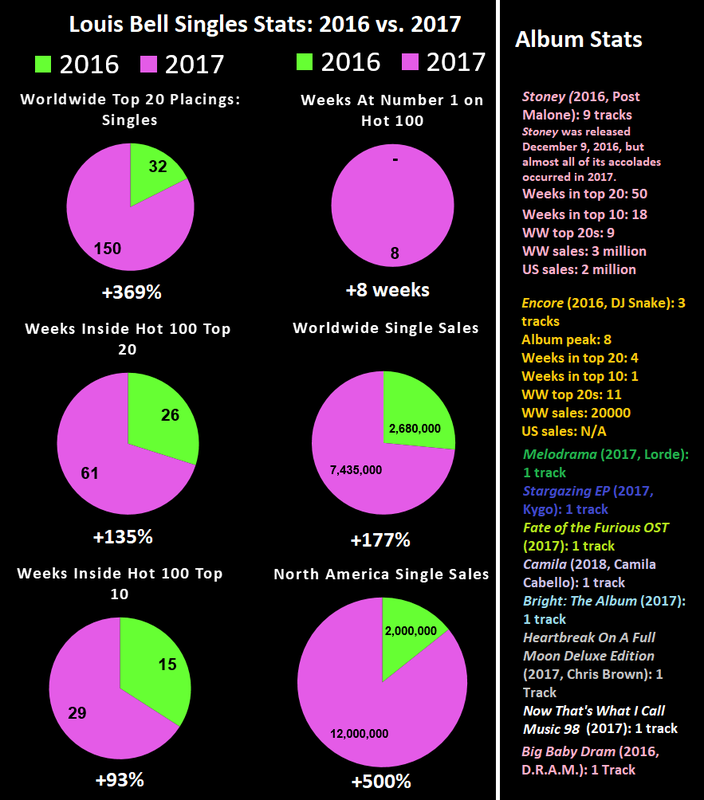 Louis Bell and Frank Dukes are genuine musical superstars, and the following stats prove their 2017 was huge, but the possibilities for 2018 and beyond are even bigger. 2017 was a breakout year for Bell, on the back of his work with Post Malone, DJ Snake, Selena Gomez and Camila Cabello. He achieved the second most single sales for a hip-hop producer in 2017, with only Metro Boomin besting him. When his contribution to rap albums was also taken into account, he was still the second most successful hip-hop producer of the year in terms of sales. His most prominent production credit is on "rockstar", the blissed-out vibe crafted by Post Malone and 21 Savage, which has spent an unheralded 8 weeks at the top of the Hot 100, and to date has been certified double platinum. He also has a credit in "Congratulations" alongside 2017's most successful producer Metro Boomin, and Frank Dukes. 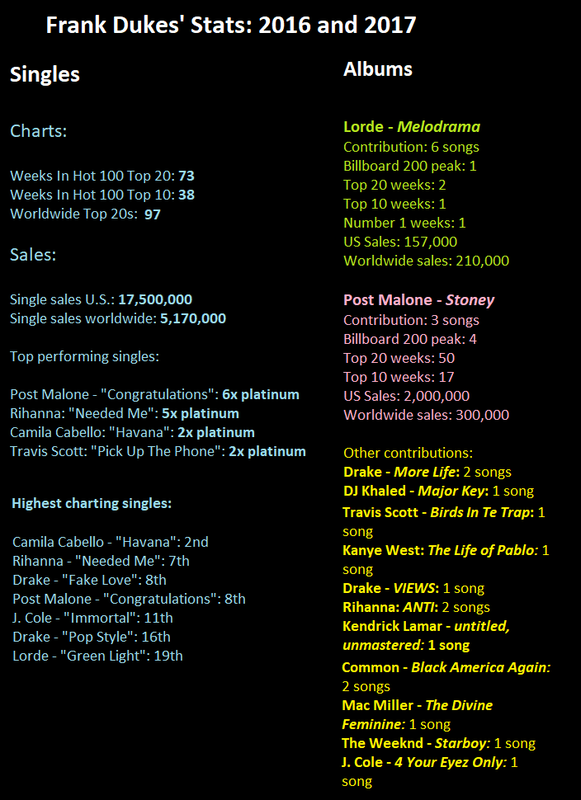 That track is now eligible for 7x platinum certification, and contributed heavily to Post's amazing year, which saw him out-chart every other lead artist or group in hip-hop. His relationship with Post Malone shot him to prominence in America, but it was work with Camila Cabello, Kygo and Selena Gomez that brought Louis Bell to the rest of the world. His production on "It Ain't Me", "Havana" and "Wolves" earned him 117 top 20 chart placings around the world, and nearly 5 million worldwide sales. Camila Cabello's album recently dropped, featuring 5 Bell-produced tracks. It landed at number 1 on the Billboard 200, and looks set to have a very solid 2018. Post Malone's next project, Beerbongs & Bentleys, is also due in 2018, and Selena Gomez told Billboard in October of 2017 new music "will be soon", so Louis Bell is set for a massive 12 months. He may yet surpass the standard he set in 2017. Frank Dukes is the most low-key super-producer in music this decade. His credits in the last two years alone include Lorde, Zayn, Frank Ocean, Nicki Minaj, Post Malone, Bebe Rexha, Drake, Mac Miller, J. Cole, Schoolboy Q, 6LACK, The Weeknd, Common, Usher... It doesn't stop. In the last 2 years he's produced over 50 high-profile songs on some of the most successful records released. His flexibility behind the boards has taken him from "Real Friends" by Kanye West to "Mabida Riddim" by Drake to "Havana" by Camila Cabello, and seen him produce alongside Metro Boomin, J. Cole, Havoc, and even BadBadNotGood. If Louis Bell is set for a big 2018, then so is Frank Dukes, and vice versa. The two collaborated closesly on the breakout hit of 2017, "rockstar" by Post Malone, and also on "Havana" by Camila Cabello. Together, they dominated 2017, and it was only an insane hot-streak by Metro Boomin that denied the two the title of "Most Successful Hip-Hop Producers of 2017". Frank Dukes' contact list is bulging with talent; with Kanye and Drake expected to drop projects this year. Camila by Camila Cabello is littered with Dukes' influence, 10 of the 11 songs feature him as a producer, and the album has already been performing well. There is no limit to what Dukes may achieve in 2018. With a contact list as diverse as his, and with a host of close collaborators (Louis Bell, Metro Boomin, Post Malone, Murda Beatz) all experiencing exponential growth in sales and audience at the moment, he may finally make it into the conversation surrounding best producers in the game. The numbers already place him in that category, it's now a waiting game, the world will eventually catch up with Dukes' discography and bestow him the appropriate status.